Facebook has introduced tools to display like button on website or blog. User can click like button on specific website to show his liking of the content and same will be posted on his Facebook timeline. Since it is new, not many websites or blogs have Facebook like button. If you are a Google Chrome user, you can use Facebook like button on any website, blog or webpage using ‘Facebook Likes’ extension. 1. Launch your Chrome browser or download it from google.com/chrome. 2. Then download and install Facebook Likes extension for Google Chrome. 3. 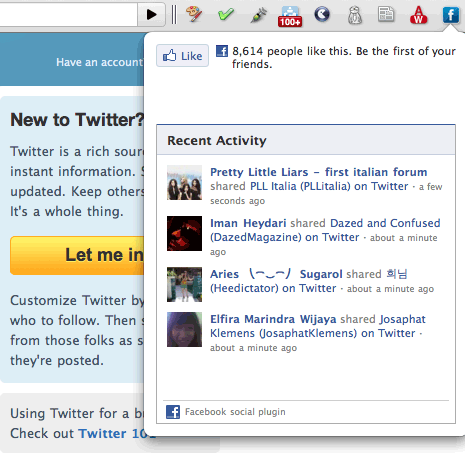 Now while browsing any webpage, click Facebook icon and then click on like button. Google Chrome Keyboard Shortcuts, be Chrome Quick!